There is one mediator between God and man, and it is not an institution many call the church. If we took half the energy they spent on wrestling with the question of whether or not we have to "go to church" and spent it on leaning into the reality of Jesus the fruit of that would change the world. 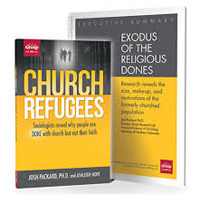 As Wayne takes a look at the Pope's visit to America and some of his previous comments about the church he also sorts through Josh Packard's latest research about the "Dones", those who have left institutionalized Christianity. He mixes in some email from listeners and one woman's story about her journey outside institutionalized Christianity and then back in to help unravel confusion about the church. While listening to the podcast this morning..the morning after the shooting in Oregon where the Washington Post headlines said “Christians reportedly singled out…”, I had to wonder why? At this point there are so many questions in such a sick senseless act but the fact that this person (according to the WP) asked students to stand up if they were Christians and then murdered them should send off alarm bells to the institutional church group. My experience is that this Sunday there will probably be more sermons on satan and his persecution of Christians in these end times than any reflection on what the institutionalization of Christianity has done to alienate people. The podcast this morning was so timely but will the church’s role in this tragedy be acknowledged? This should be a wake-up call to all Christian institutions. They are falling short. This is how “abuse” from the pulpit manifests in the world and the IC “church” points the finger at everyone else but themselves. I wrestle with would I have stood up when the shooter asked all Christians to stand, remembering all the sermons on how if I denied Christ, He would deny me. It’s so twisted. It will be interesting to see if this topic comes up at the conference in Colorado. Thank you Wayne for opening up this much needed dialog and please do not think I put the blame for all the evil in this world at the feet of the I/C. If anything this shines a light on how important is for each and every one of us to be responsible for our own discipleship. To study to make ourselves able to share the true gospel through the way we live our lives. Hi Bev, a quick note to say I appreciate your thougtful take as you expressed it in your post. Profound. I found myself transcribing the last five minutes just so I could fully absorb the weighted truth of the words you spoke, Wayne. Thank you.